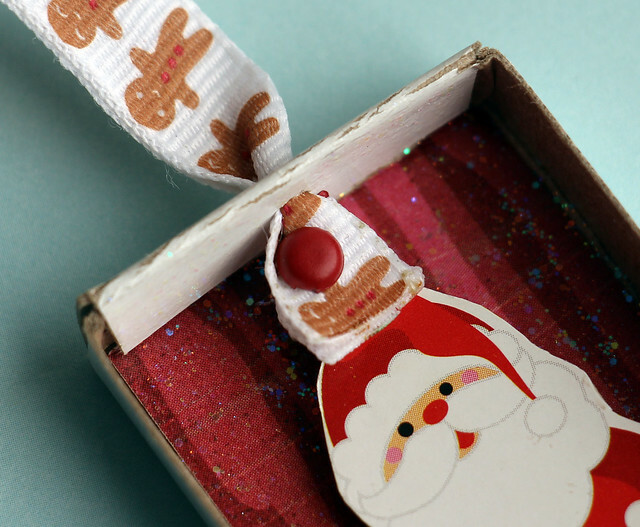 Want to make some quick and ridiculously cute ornaments with your kids? 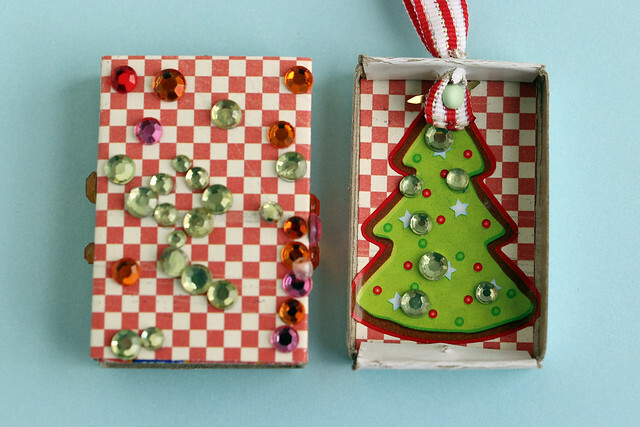 Try making Matchbox Ornaments! Augie, my five-year-old, and I made eight of these little cuties in a single sitting. They are quick, fun and economical — all the supplies we used were pulled from my crafting stash — and the ornaments themselves delight with the hidden surprise inside. We started with a brick of matches in individual matchboxes that I bought at the dollar store. 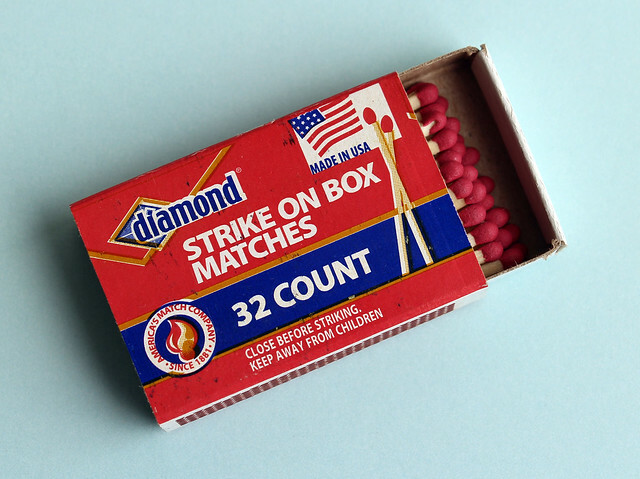 We’ve been using these around the house for awhile, so I’m not positive how many were in the package to begin with, but I’m guessing it held a dozen small match boxes. We dumped all the matches out of the boxes and into a mason jar so we had enough empty boxes. At some point I’ll put sandpaper on the jar lid like I keep seeing on Pinterest. 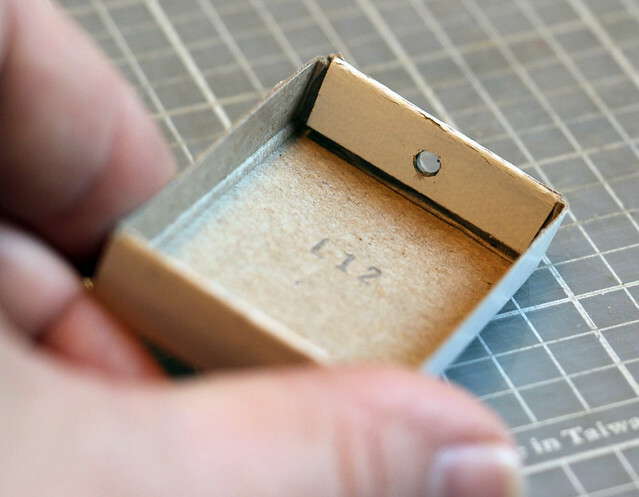 Once you have an empty matchbox, there’s a little preparation to do. First, remove the inner tray and poke a hole in the end for the ribbon that will be used to hang it on the tree. At first I was just poking the hole with a pair of sharp scissors , but then I remembered I have a teeny little hole punch and I switched to that. Next, measure the height and width of the tray and cut a piece of pretty paper to just slightly smaller than those dimensions. Run a glue stick over the back of the paper and press it into the bottom of the tray. 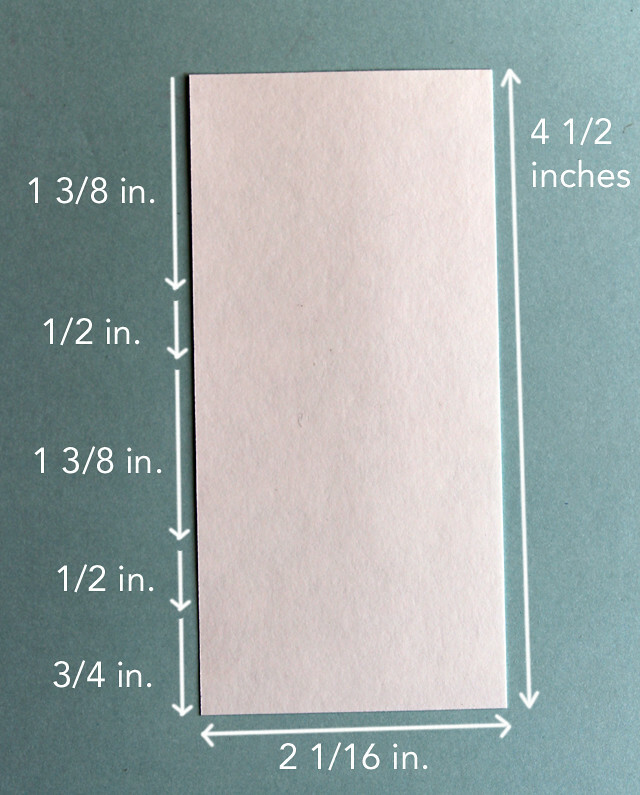 Now cut a piece of paper that’s as wide as the outer sleeve and as long as two of the wide sides and two of the narrow sides added together, plus a little extra so the paper will overlap itself. Clear as mud? 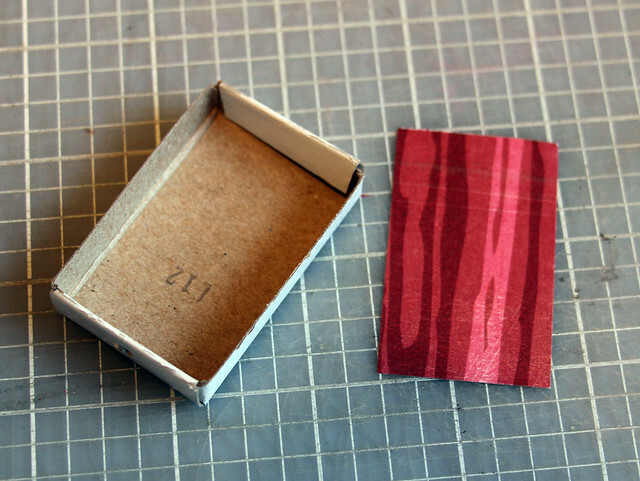 Let’s try this: the sleeve on my matchbox was 2 1/16 inches wide so that’s how wide I cut my paper. 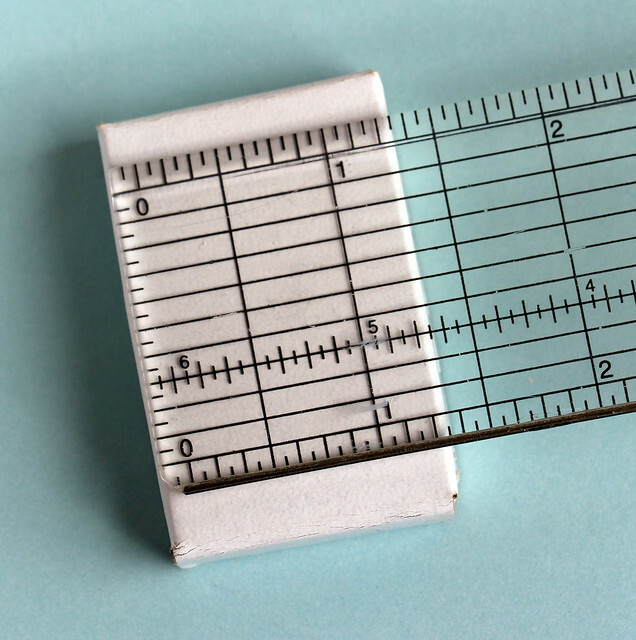 Your matchbox could be different, so be sure you measure. The broad, flat surface was 1 3/8 inches high, and the shorter edge was 1/2 inch deep. I added both of those lengths together, multiplied by 2 (for the other two sides) and added an extra 3/4 inch so I had some wiggle room. 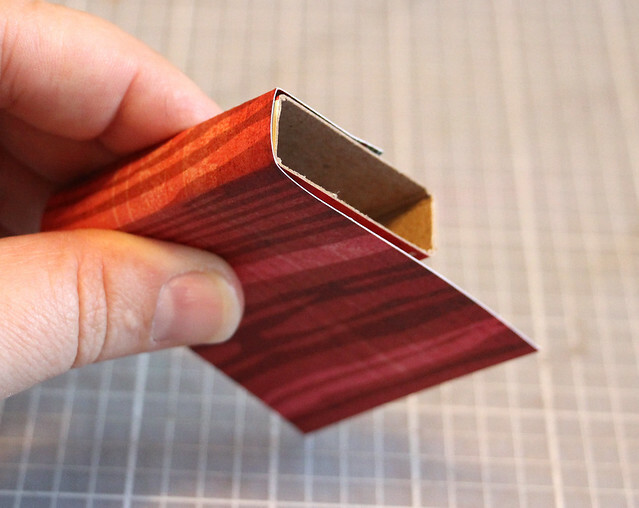 This will give you nice sharp edges on the matchbox and will look nicer. 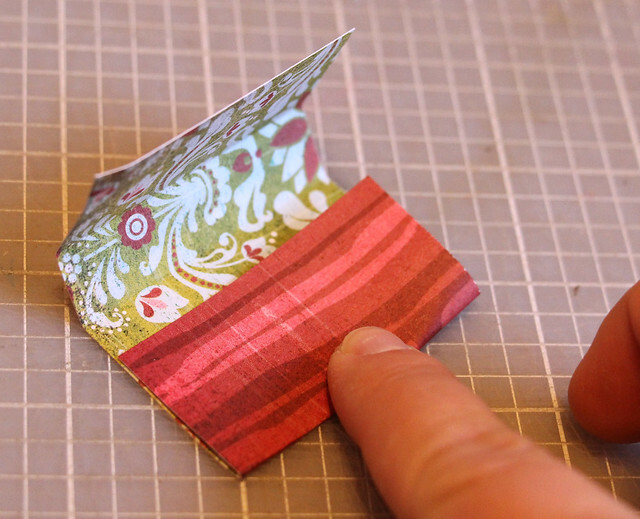 Once you have all the creases made, use glue or double-sided tape to adhere the paper to the outside of the sleeve. The next preparation step is to add a ribbon for hanging. Cut a piece of ribbon about 4 or 5 inches long, then poke the ends through the hole you made and stick a colorful brad through both layers of the ribbon. This will keep the ribbon from coming out when you hang it on the tree. 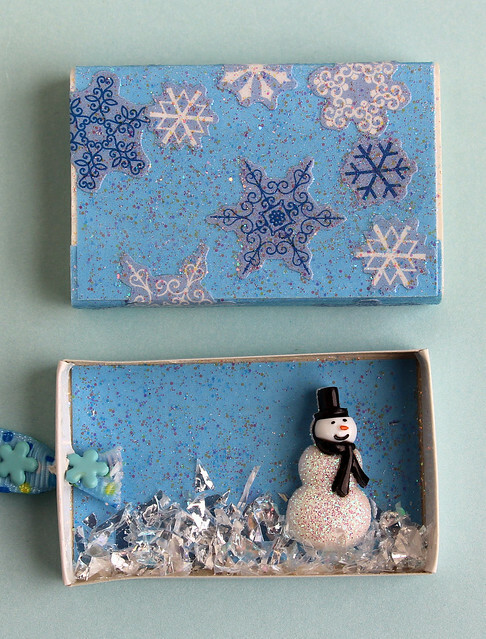 Now comes the fun part: decorating the boxes! The easiest way to decorate is to pull out some Christmas stickers and go at it. I bought two pads with hundreds of stickers in them for a dollar each at the craft store. Bargain! Augie plastered the outside of the box with stickers and I placed a Santa inside. Then we got a little fancier and blinged out our plain stickers with gem stickers . I put a Christmas tree sticker inside this ornament and Augie added the jewel stickers for some sparkle. Then he went to town on the outside of the box. I can’t wait to see how this one sparkles from the tree lights! 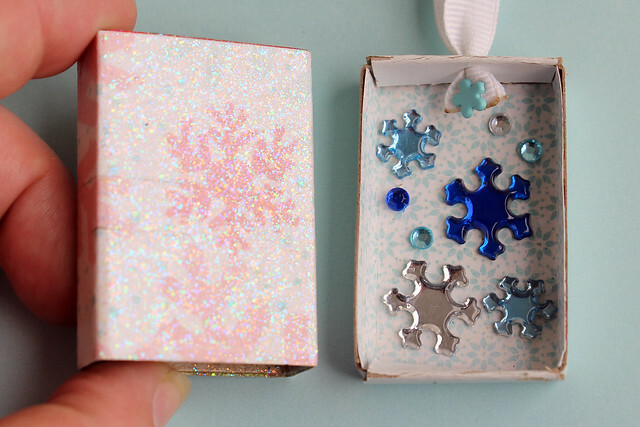 Gem stickers, pretty paper, Sparkle Mod Podge: I found these snowflake gem stickers in the dollar spot at Target a few weeks ago so they went inside the box. Then I pulled a scrap of pretty snowflake paper from my stash and wrapped that around the sleeve. To make it extra sparklicious I painted the paper with a few coats of Sparkle Mod Podge . 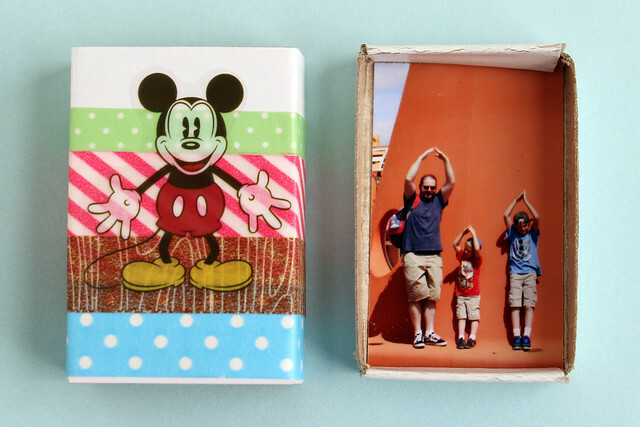 Washi tape and a photo: I wrapped washi tape around the outside of the matchbox, added a Mickey sticker, then cut a photo of my fellas from our trip to Disneyland earlier this year to fit the tray. This would be a great gift for kids to make their grandparents. Have your child paste a photo of himself to the inside and then let them loose to decorate the outside. Super cute and easy to mail if Grandma and Grandpa are far away! 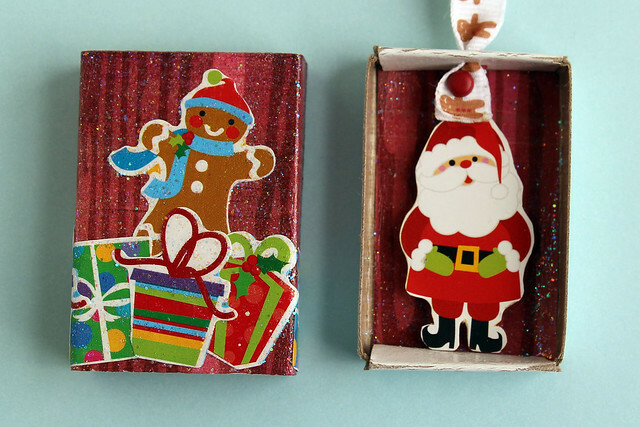 How would you decorate your matchbox ornaments?